Katy Bevan is an independent curator, writer and educator with a specialism in craft. She works as a freelance consultant within formal and informal learning situations with a particular interest in the connective nature of craft in communities and the relationship between craft and wellbeing. 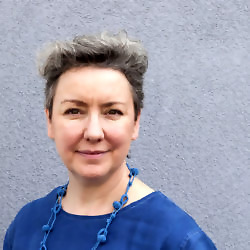 She writes for textile and craft magazines such as Selvedge, The Knitter and Rowan Knitting and Crochet Magazine, is a practical craft editor, designer and art-director, blogs at The Crafter and is a Fellow of the Royal Society of Arts.